The Path Of Light: Book One, Light Descends, A Paranormal Angel Romance by R.J. Lafleur takes us into the stories we think we know and shows us something else. Before the great war and the fall of Lucifer, when Lucifer had strength once more to finish the battle for mankind for good, one single angel is chosen to go among humans and work to turn them back to the light, away from everything that is dark and tempting. The fact that the book opens immediately with Gabriel thinking of Magdalene and her long red hair instantly took me into a place where I knew I was going to enjoy this book. The story flows very nicely, the pacing is almost perfect, and the characters come to life on the page. There truly are moments during some of the character banter where I could have been sitting in the same room with them, and that is my idea of an engaging and perfect read. I love a good paranormal novel and while most of my paranormal reading stays within the realm of vampires and such, I do like a good angel story as well. So, getting the chance to read this novel by author R.J. Lafleur was right up my alley and I am very glad that I was able to read this. 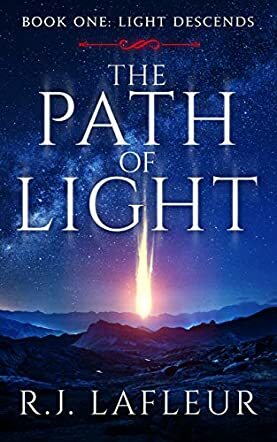 I don’t want to give anything away but I can say without a doubt that The Path Of Light is one of the better angel romance paranormal stories I have read, and if you enjoy the genre you will enjoy this book as well. I can’t wait for the second installment of this series. The Path of Light is a work of paranormal and Christian romantic fiction written by author R.J. Lafleur, and the first in the Light Descends series. Written for adults due to its mature sexual content, this 'angels and demons' style tale takes us all the way back to the beginning of the biblical universe when Lucifer falls from grace. As Lucifer prepares to rise again and take the earth back, God and his counsel decide to send a single angel to Earth to turn humankind away from Lucifer’s darkness. Along the way, this angel learns about the reality of being human, along with its many heartbreaks. Both spiritual and biblical fans of Christian fiction who are looking for a more epic tale are sure to be entertained by this interesting and action-packed volume. Author R.J. Lafleur writes emotively on the topic of the human experience and how difficult it can be to distinguish between good and bad in the modern world, and the ‘light’ which God’s chosen one shows to humanity offers some clarity on this. I think the biblical references are so strong that you really need to know your Bible well to fully appreciate the text, but the overall message of good versus evil was well constructed and turned into an epic battle for the fate of mankind, which it seems will continue into future books in the series. Overall, The Path of Light comes recommended for fans of Christian fantasy fiction and spiritual paranormal readers. The Path Of Light is book one in Light Descends, A Paranormal Angel Romance series by by R.J. Lafleur, a splendid blend of romance and the supernatural. Lucifer has risen from the depths of hell and is determined to carry his darkness right to the gates of heaven. It's a new fight and he has assembled a host of followers and is set to fill humanity with darkness. But God has his own plan, one as ancient as himself — the path of light. He sends one of his angels to earth, divesting her of her angelic powers. She is a human armed only with the light. While wrestling with human realities of fear, love, desire and heartbreak, she also has to deal with the arsenal of Lucifer's might. The Path Of Light is a narrative with powerful spiritual themes and the author seems to deepen a reflection on the theology of incarnation. This time, an angel takes human form in order to bring light to humanity. Only this time, it's not the Son of God, but a female creature. The conflict is phenomenal, one that is primordial as well — the conflict between good and evil, between darkness and light. The writing is filled with religious and mythological symbolism, yet it feels real. R.J. Lafleur is a skilled writer with a unique gift for creating intense and powerful scenes. The writing is filled with insightful passages, dynamic action, and bursts of wisdom that will inspire many readers. The Path Of Light is fast paced and engrossing, with a strong appeal to fans of Christian literature.